JB Creations: The importance of spiraling in Social Studies! 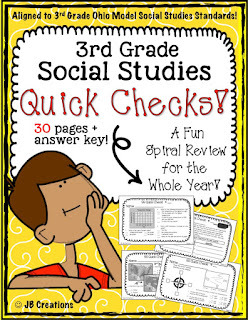 The importance of spiraling in Social Studies! It’s true that every student learns in their own unique way. However, I feel that one constant that remains the same regardless of individual learning styles or strengths is the idea that the more something is presented and practiced, the more likely it is to “stick”. This idea is nothing new to the world of education. Math topics are always being reviewed with taught skills being presented in a variety of different ways. The same is true for reading and writing as comprehension and vocabulary skills in language arts build upon a spiral foundation. However, finding this similar practice in social studies or science can be more difficult. Since there is so much content to cover in these types of disciplines, teachers are often forced to use their time to present and assess a topic one right after another, leaving little time for revisit or review. I would argue that in a subject requiring large amounts of information to be absorbed and understood, the idea of spiraling review items in that particular curriculum would be a no brainer and essential for optimum learning. Too bad that it’s often not the case! Since I found myself facing these challenges in my own classroom, I decided to create something to meet this need. Because my economics unit on budgeting, wants & needs, and money management provides the underlying base for my yearlong classroom economy that I use as part of my behavior/reward program, I certainly didn’t just want to spend a few weeks learning those skills and then forgetting them. I decided to create a short form that would assess and review the key points associated with that particular topic and then present them to the students periodically throughout the year as I felt a review was necessary. This turned into my QUICK CHECKS. In addition, I wanted to create something similar that I could use to touch on each of the four strands weekly as a way to provide a constant review for students. This became my SOCIAL STUDIES STRETCHERS. I really feel that these two simple strategies have helped solidify and deepen my students overall understanding of social studies and how all of the parts can be connected. 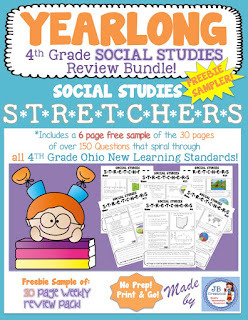 Here is a quick sample of both of these spiral review activities that I have shared in my TPT store. Please feel free to check them out and to see if they would be useful in your own classroom! Click here for a freebie! Hello! I am a 4th Grade teacher who loves to share and collaborate on creative ideas! I currently teach an integrated Language Arts and Social Studies class. Everything I do incorporates these 2 subject areas which provides rich and meaningful connections for students everyday! Check out my pins and boards!